BreakThru Radio (BTR), the Internet's voice of the World's Best Independent Music, announced today the premiere of its brand new specialty show, the "BTR Beach Party." This fun new show kicks off just in time for the summer season and features a cheerful playlist guaranteed to get listeners in the mood for some fun in the sun. "BTR Beach Party" is the latest installment in the station's successful series of specialty shows. This rousing new set can be found only on http://www.breakthruradio.com. Listeners can enjoy this great show that really captures the unique energy of Coney Island. 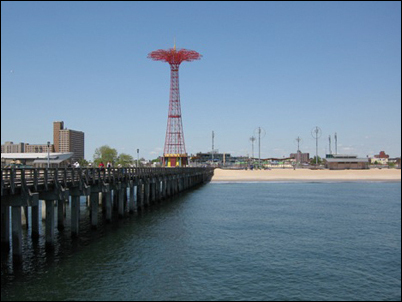 "Some of the New York area BreakThru Radio DJ's combined two of their favorite things - Coney Island and great music," explains BTR's DJ Maia Macdonald. "On the show, we included songs that you can either dance to or relax on the beach with." Recorded at Brooklyn's own Coney Island, "BTR Beach Party" is comprised of special summer songs handpicked by several of the station's DJ's. Included in the show are great songs from artists such as Of Montreal, Belle and Sebastian, The Pinker Tones, Illinois, Todd Carey, Broken Social Scene, and Erin MeKeown. "The BTR Beach Party is a great opportunity for us to put together a unique mix of music specifically designed for summer," exclaims BTR Music Director Annie Russell. "Listeners can enjoy this great show that really captures the unique energy of Coney Island." "BTR Beach Party" premieres on BTR today and will be available in the station's archive and program guide, along with all of BTR's previous specialty programs. Listeners can tune in to hear all of the DJ's spectacular summer picks by visiting http://www.breakthruradio.com. BreakThru Radio (BTR) is the Internet's source for the World's Best Independent Music, where expert DJs expose the rich underground of sound not found on commercial radio. Whether it's death metal, dancehall, hip-hop, indie rock, roots country, reggae, electronica, acid jazz, ambient beats, dub, two-step or folk, whatever genre you can imagine, BTR has it well-stocked, and with no expiration date. In a world where independent music is becoming infinitely more accessible, the need for informed sources to filter out the best of it has become a necessity. Music fans across the globe are beyond frustrated with commercial radio, and often feel victimized by it. "Music for music lovers," is BTR's motto, and one that its DJ's take very seriously. BTR offers its listeners unlimited access to underground music, twenty-four hours a day, seven days a week, with a daily audience that includes more than two dozen countries. With its unique on-demand musical programming and focus on the best in new, independent music, it's no surprise the site has garnered over 80 million listeners in its first year. 2007 has seen the addition of independent video coverage to BTR, as well as top-notch editorial content and an intuitive global show calendar. In fact, you could say that BTR has taken everything a music fan could ever need or want, and put it all into one cohesive website, completely free of charge. Unlike other radio stations, BTR offers on-demand programming; a first in internet radio. Listeners can cater to their specific musical preferences, and at the same time discover the best independent and unsigned artists from across the world. Using the cutting edge technology of UpSNAP, BreakThru Radio makes all of its shows more accessible to an on-the-go market of students and young professionals, via exclusive access to its on-demand programming through the medium of mobile phones. BreakThru Radio services are available through virtually all of the major carrier networks in the U.S., including Nextel/Sprint, Cingular, Verizon, Alltel, AT&T and T-Mobile. BTR can be heard on http://www.breakthruradio.com and http://www.NYTrack.com, New York's only website dedicated to the tri-state high school track community, thus reaching over 5 million high school students.